Endoscopic CycloPhotocoagulation or ECP, is an exciting development in the management of many types of glaucoma including the more common open-angle glaucoma and narrow-angle glaucoma. ECP is performed on an outpatient basis. 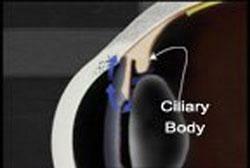 In this procedure, the ciliary body of the eye, which creates fluid, is treated with a laser. This reduces fluid production that in turn, reduces intra-ocular pressure. The ciliary body is a small gland running around the circumference of the eye located behind the iris. ECP allows the surgeon to view the area through an endoscopic camera, which aids in the very precise placement of the laser beam used for treatment. Endoscopic CycloPhotocoagulation is often performed on patients at the time of cataract surgery. It can also be performed on those patients who had SLT or ALT laser procedures,glaucoma filtration surgery or other surgical procedures that were not successful at controlling intra-ocular pressure. ECP has proven to be an effective way to reduce intra-ocular pressure. Studies have shown that the majority of patients have their glaucoma medications reduced or completely eliminated after the procedure and are no longer at risk of loss of vision from glaucoma. ECP is most often performed at the same time as cataract surgery, after the cataract has been removed from the eye. No additional incisions are required. 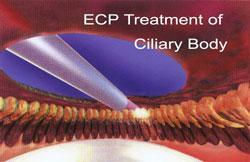 The ECP probe uses tiny, optical fibers to illuminate, view and treat the ciliary body with laser energy. Approximately 20 to 40 laser applications will be administered. Your eye pressure will be checked shortly after your procedure and drops may be prescribed to alleviate any soreness or swelling inside your eye. You may also receive oral medications to control inflammation. You should relax for the rest of the day. Follow-up visits are necessary to monitor eye pressure. It may take a few weeks to see the full pressure-lowering effect of this procedure. Most patients resume normal activities within a few days. The effect of the surgery may wear off over time, but the majority of patients have their pressure reduced and many can eliminate their need for glaucoma medications. However, this procedure and other glaucoma surgical procedures does not restore lost vision. Serious complications with Endoscopic CycloPhotocoagulation are rare, but like any surgical procedure, it does have some risks. Prior to your procedure, you will be given additional information that will allow you to make an informed decision. Be sure you have all your questions answered to your satisfaction. If you would like more information about this procedure you can request an appointment or contact the office for additional information. I have had eye surgery with both Dr. Kevin Dinowtiz and Dr. James Pasternack. I was very pleased with the results and the wonderful follow-up care after surgery. When I started to experience problems with my vision, I was concerned about what could be done. The staff at Primary Eye Care were wonderful in explaining Blepharoplasty (eye lid) procedure and alleviating my fears. The surgery went just as planned and now my vision has been restored just as promised. I couldn’t be more satisfied. After having cataract surgery and eye lid surgery at Primary Eye Care Center they are number ONE! Dr. Pasternack and the staff at Primary Eye Care Center did an excellent procedure to restore my vision. I will always recommend Primary Eye Care Center. Dr. Dinowitz and the staff at Primary Eye Care Center restored my vision to nearly 20/20. The surgery was painless, the care top notch, and the results better than I expected. The entire staff was professional and informative. I have recommended Primary Eye Care to several of my friends with complete confidence that they will receive the same outstanding service and results. My experience at Primary Eye Care was a very good one. Before my eye lid surgery, my ability to see was greatly limited. Since the surgery, I am back to driving and my normal routine. I highly recommend this procedure for others that have the same situation that I did. For years I have had problems seeing because of droopy eyelids. I felt as if I had a curtain over the upper part of my eyes. Thanks to Dr. James Pasternack, I can see more and I am told I look much younger. The operation was painless from start to finish. It has been two weeks and I feel great! Thanks to Dr. Pasternack and his staff. Prior to my cataract surgery I saw halos around lights, my distance vision was poor and I kept thinking my contacts were dirty. Since surgery, the distance vision is great, I can read street signs and no more blurring. I love to read and I am thrilled with the results! Everyone at Primary Eye Care Center was professional and friendly. I was completely at ease for all visits and both surgeries on each eye. I want to thank everyone at Primary Eye Care Center for a comfortable and successful procedure. My experience with Primary Eye Care Center was outstanding. I had cataracts and could not see to read or drive. I love reading novels with a happy ending and thanks to Dr. Dinowitz all of my novels always have a happy ending now that I can see them without the cataracts. Dr. Dinowitz also made it possible for me to see all the glory of the fall colors here in New England that I had been missing out on! I would never hesitate to recommend Primary Eye Care Center to anyone needing eye surgery or any procedure necessary for vision problems. The care given prior, during and after cataract surgery was exceptional. I am very pleased with my eyelid surgery performed by Dr. Pasternack in the Eye Surgery Center at Primary Eye Care. I have received many comments such as; “How do you manage to stay looking so young”? The procedure was without discomfort and didn’t take very long. Before having this procedure done at Primary Eye Care Center, my sight required me to wear eyeglasses on a daily basis. I had to change glasses whenever I wanted to use the computer. Now that I have had cataract surgery, I no longer need to wear glasses on a daily basis at all. However, I do require reading glasses for fine print up close. Now that I have my total vision back I can show off my “beautiful eyes” thanks to Dr. James Pasternack. He was so gentle; the procedure took less than 20 minutes and pain free. I would recommend everyone to have this procedure done and be set free from glasses forever! It has been a year since I had cataract surgery on both of my eyes at Primary Eye Care Center. I was able to see the same day each of the surgeries were performed. There was no pain, and no way to tell I had eye surgery. Dr. Pasternack recommended Restor lenses, which he explained would mean “no glasses” after surgery. Dr. Pasternack and his staff were very professional and caring. I will always be grateful to them. Restor lenses really opened my eyes! Before I had the Restor cataract surgery, my vision was cloudy and small print was becoming hard to read. After seeing the video, and being an avid reader, I decided to go with the Restor. Now, I never pick up a pair of glasses to read books, street signs or a recipe! Also, the colors are sharper and brighter. Everyone at the Eye Surgery Center put me at ease and were very informative. After 50 years, all I can say is WOW no more glasses! The experience of cataract surgery was amazing. Dr. Dinowitz and his staff were very professional and made me feel comfortable from the very first visit. On the day of surgery it was all about me, the nurses kept me relaxed and Dr. Dinowitz was very professional, caring and comforting throughout the procedure. After I came home I was able to take off the eye patch and was amazed how well I could see the alarm clock the very next day without squinting. I asked my husband if he had cleaned the TV screen because it was so white and the colors were very vibrant like never before. It was like a new world and only one day after surgery. The Toric Lens I chose for my cataract surgery corrected my distance vision and astigmatism, I am now able to drive, watch TV and do so many things without the hassle of glasses. I highly recommend Dr. Dinowitz and his amazing staff. Primary Eye Care Center’s staff are the most friendliest group of people whom I have met. They are very knowledgeable about the eye care industry and are attentive to the needs of their patients. I find them to be friendly and pleasant. The doctors always ask if you have any questions after the diagnosis process and they are so accommodating. I am so happy to tell you about my “new” vision. I started wearing glasses at age 11. Though the years my vision has changed many times. As a senior it had become more challenging. My appointment with Dr. Dinowitz in 2011 was to be a reversal in how I saw. I was told about the new AcrySof Toric lens and how it could correct my astigmatism and distance vision. I had the surgery and can’t believe my distance vision is so good. I can now drive at night. What a blessing. Thank you Dr. Dinowitz for a new lease on life. I was extremely pleased with my entire experience at Primary Eye Care Surgery Center in Bloomfield. There was adequate and timely communication throughout my experience before, during and after my cataract surgery with the AcrySof ReStor multifocal lenses. Everyone was so courteous, professional and caring. My experience there could not have been more satisfying! Thank you! Prior to my surgery, I had worn glasses for almost 60 years. As long as I can remember, the first thing that I did in the morning was put them on and the last thing was take them off. The only good thing about that was that I always knew where they were. Over the years, I tried and lost several pairs of prescription sunglasses and clip-on’s and I never seemed to have them available when I needed them. When we discussed my lens options for cataract surgery, I knew immediately that the need to carry a pair of glasses to see anything within arm’s length would be a constant irritation so the decision to use the AcrySof Restor lens was a slam dunk for me. The surgery itself was easy; absolutely no pain, discomfort and no after effects. I had both eyes done one week apart. On the day of surgery, the vision in the first eye was so good that I’ve never worn glasses again. Even with only one corrected my distance vision seemed better than it had been for years even with my glasses. The AcrySof Restor lens has had a real impact on my life and I strongly recommend them to everyone. Dr. Dinowitz has been my ophthalmologist for many years and has performed cataract surgery in both of my eyes over five years ago. All of my experiences at Primary Eye Care Center have been timely, professional and pleasant. My eyes are doing very well thanks to Dr. Dinowitz. I highly recommend Dr. Dinowitz and his staff. I chose to have the ACRsof Toric Lens at Primary Eye Care in the hopes of better vision. It was the best choice I’ve ever made. Prior to my surgery, my eyesight was horrible. I’ve had to wear glasses since I was 5 years old and my eyesight got progressively worse over the years. After my surgery, I felt like a walking miracle. Never before was I able to open my eyes in the morning and be able to see so clearly. I am so grateful to Dr. Dinowitz and his entire team. They were kind, professional and able to put me at ease. I couldn’t be happier or more grateful. In October 2013, Dr. Dinowitz performed cataract surgery on both of my eyes. I have needed glasses for 60 years. Over the past 5 years I developed cataracts and my vision deteriorated. There was no pain during surgery. I elected to have the ACRsof Toric lens and I amazed at the improved quality of colors and visual clarity for distance vision. My astigmatism was also corrected. The overall results exceeded my expectations. Dr. Dinowitz is outstanding and the staff is very professional. I went into Primary Eye Care Center wearing glasses all the time, I left with 20/20 vision after my cataract surgery. The procedure was painless and I would highly recommend having the surgery. My experience was amazing. I had stopped night driving because my vision was so terrible in addition to having trouble reading. The surgery was quick with very little discomfort and the results were amazing. My vision is 20/20 after surgery and colors are now very brilliant. I couldn’t ask for more. 2019 © Primary Eye Care Center. All rights reserved.